You don't really care about inclement weather when you go birding. In fact, sometimes the more inclement, the better the birds. 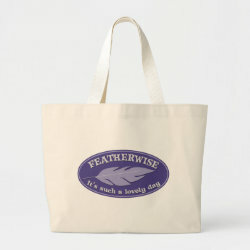 No, what really matters More... are the birds themselves, so you could say that Featherwise It's Such a Lovely Day. Weatherwise -- meh. This cute oval graphic design done in shades of lilac features a large illustrated feather. It will have you humming Old Blue Eyes no matter what the weather is like!